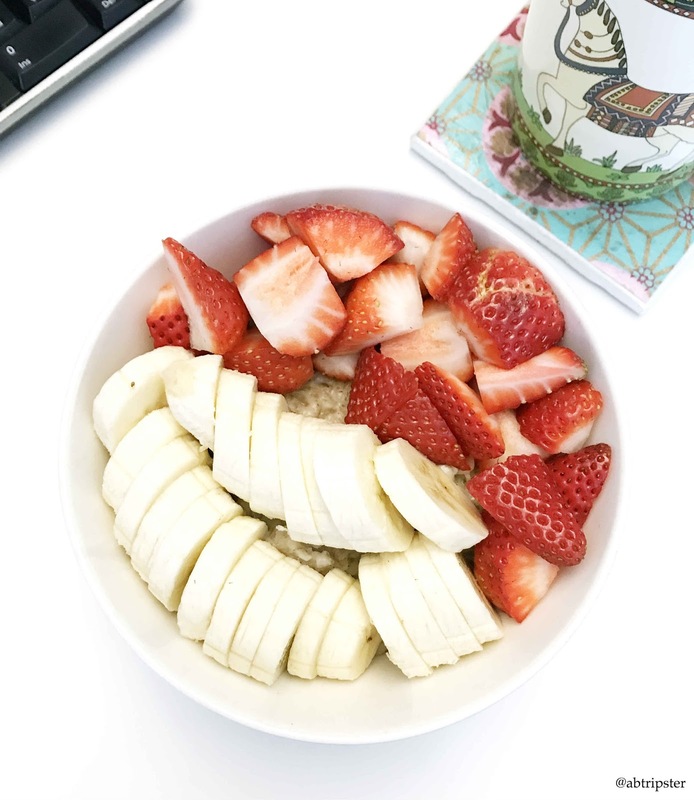 Good morning, oatmeal loving friends! This little post is near and dear to my heart simply because it's my go-to budget breakfast at work. It's filling, sweet and stuffed with fruit! I've never truly loved oatmeal until I became an adult. I was cream of wheat kiddo all the way. No question. I was very particular about it too. First of all, only my grandmother could make it and it had to have a cinnamon stick in it. Obviously, as I've gotten older, I learned that cream of wheat isn't the only breakfast food that makes me happy. I have tons of breakfast loves on my salad blog. However, oatmeal has become somewhat of a staple primarily because it's easy and inexpensive to make. It also doesn't take a lot of time and you can make it at night and just add the fruit in the morning. Don't use water. Use Coconut milk. When I make my oatmeal on the stove top I love my oats to be soaked in coconut milk. I then add 1/2 tsp of cinnamon and 2 Tbs of honey. That's right, you read that correctly. The sweeter the better to mix with my fruits. I also add a pinch of salt while it's boiling. The key is to keep it simmering and not boil over. You got to really watch it. I realize a lot of people realllllly hate waiting on oatmeal and you can always get the "quick oats" kind. I like those for the microwave the best. I'll add water to that mix but it's still not as good as the coconut milk. Again, these bowls keep me full til noon and sometimes longer than that! My other trick is mixing up the fruit. Certainly, I love bananas and strawberries. Those that know me IRL know that I eat a banana almost every single day. They're delicious and help you run faster. They prevent charlie horses and provide excellent potassium. What other kind of super fruit do you need? On that note, mixing up the fruit is what keeps it fun and colorful. I love blueberries and raspberries. If you're a tropical lover I highly recommend mangos! Even frozen mangos bode well. I'd love to know how others like their oats. What's your favorite concoction? In a sauce pan, bring milk to a boil. Add in rolled oats and bring to a boil again. Once to a boil, lower heat to a simmer and keep at a simmer til coconut milk soaks into the oats and are fully cooked. Stir in honey, cinnamon and salt while oats are still cooking, preferably at the end for the honey to melt nicely. Remove from pan and add to bowl. Cup up fruit and add to bowl. Enjoy! Optional: Add walnuts or pecans! Especially if you enjoy a little crunch to your breakfast.